Brazilian cameraman Santiago Andrade, who was injured in clashes between protesters and police last week in Rio de Janeiro, is brain dead, doctors say. Mr Andrade, 49, who works for Band TV, was hurt after a device exploded behind his head as he covered a rally against fare rises at Rio's Central Station. Mr Andrade underwent brain surgery and it is not clear whether his life support has now been turned off. President Dilma Rousseff said the event caused "revulsion and was saddening". The president also said that she had asked the Federal Police to help with the investigations if necessary. "It is inadmissible that democratic protests be twisted by those that don't have respect for human lives," she wrote on Twitter. 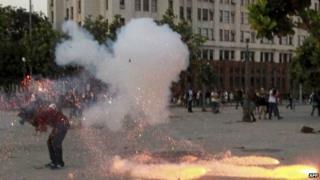 The case has prompted angry reactions in Brazil, with many accusing the protesters of having caused the incident. Journalist associations and unions have released statements demanding better safety conditions for professionals covering protests. On Sunday, police arrested a protester in connection with the incident. The man told local media that he had held the explosive device, but denied throwing it. "Our main aim is to identify the person who's responsible for setting off the device which hit Santiago," police official Jose Pedro Costa told a news conference. Mr Costa said that the suspect in custody would be treated as a co-author of the alleged crime as "he knew it [the explosive device] would be thrown when he handed it to another protester". Doctors declared Mr Andrade brain dead on Monday morning. Hundreds of protesters clashed with police during the rally against increased public transport fares last Thursday. The protests followed an announcement by Rio Mayor Eduardo Paes of a 9% rise. The demonstration started off peacefully but turned violent after protesters moved to Central Station, a major underground, train and bus hub. Riot police fired tear gas and tried to disperse the crowd while demonstrators hurled stones and petrol bombs. Commuters were caught up in the violence, and local media reported Mr Andrade and six more people were injured. Last year, similar protests grew into a nationwide movement against corruption and excessive spending ahead of the football World Cup, which Brazil will host in June and July.